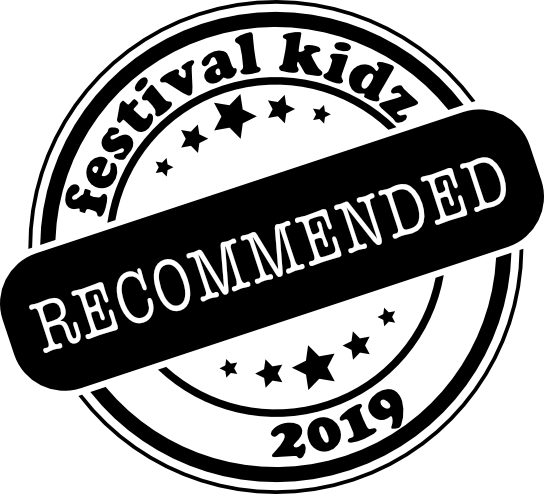 We are delighted to have been selected for Festivalkidz Recommended status which was chosen by parent reviewers. We are proud to have been selected for this and we promise to have an amazing children’s village once again catering for all ages. THE CHILDREN’S VILLAGE promises another action-packed year full of fun, laugher, education and general festival craziness. The Village Green hosts disco dance workshops, circus skills, it’s a Knock Out, busk stops, the Village Green stocks to throw things at your parents or a rubbish band performer (should they dare venture into your area). The Children’s Village welcomes for the first time the rather insane Professor Pumpernickel. The mad professor who travels the country with his laboratory of lunacy and If you like fire, explosions, loads of mess and mind-bending magic, you will love him. The Village Hall is playing venue to Mimi Maestro, action songs for little ones, Family Jam music workshop leading to a Family Jam Live show on Sunday afternoon, discos and a whole lot more. We have a Disco Parade Sunday 5pm with carts, buggies and procession of Disco children, opportunity to decorate yourself, buggy or cart in the Bearded Kids tent. Bearded Kids Tent has lots of disco related craft workshops running throughout the festival. The Beard Factory tent is back making beards for little ones throughout the weekend and we also have a Lego tent, Sensory Play tent with slime, Story Tent with typewriters, puppet theatre and many more exciting word activities. Natural Craft tent doing disco rocks, enviro-glitter pine cone mobiles and grass heads. Pamper salon giving the little ones festival nails and fake tattoos. Baby Boo is back with Baby First Aid sessions for parents, baby changing facilities, microwave and other baby essentials. All the above is free of charge and the whole of the Children’s Village is no smoking and only children accompanied by parents/guardians can visit. Please note the Swamp Trash circus are doing a full day of workshops for children on the Friday of the festival accomodating children not attending the school. A full schedule for these activities will be announced very soon.